We have some light humor today as well as a terrific, pick-me-up convention-style gospel song. If you just want to hear the music, move the timer (red line at the bottom of the screen) to 5:15. Way above each tear and sigh. Heavenly Father, let me take up the shield of faith this morning and carry it before me throughout the day. For the darkness of the world attacks my soul from every direction. The world wants me to hate myself and hate you, precious Lord. It tries at every turn to seduce me to the emptiness of revenge. It lures me to the love of money. Envy, anger, and vanity are the traps it sets. It tells me to worship myself until I am hollow. Pride is its bait, and death is its reward. My Father, I pray that I may have patience to live through the difficulties of life. May I correct my faults, that they may not destroy my peace and take from me my strength; help me to center my life in brightness and hope. Then he fell upon his brother Benjamin’s neck and wept, and Benjamin wept upon his neck. And he kissed all his brothers and wept upon them. After that his brothers talked with him. When the report was heard in Pharaoh’s house, “Joseph’s brothers have come,” it pleased Pharaoh and his servants. n earlier times, the “Land of Goshen” was a well-known phrase. At least 30 states in the U.S. have incorporated towns named Goshen, not to mention numerous villages and townships, counties, etc. These were named, of course, in a time when the Bible was more widely read and better known; it is unlikely that one person in ten, today, would have any idea what the word Goshen referred to. It does live on in the expletive “gosh”, which is itself less heard than in past times. It is thought to sound unsophisticated today and you would only hear it in a movie or t.v. show said by a hick or rube, or perhaps by a child. In fact Granny, on the old t.v. show Beverly Hillbillies, would actually say “Land of Goshen!” on occasion. But language has gotten coarser, or at least, coarse language is more widely accepted in public than it once was. The Egyptians looked down on tribes who herded livestock for their livelihood; the Pharaoh’s power lay in the great grain harvest of the Nile, and so, naturally, manorial farming was considered the highest form of basic economy. Joseph was not known as a herder; his service had been to the organization and storage of the grain crop. But the low-class lifestyle of his family and tribe will cause trouble, as we shall soon see. 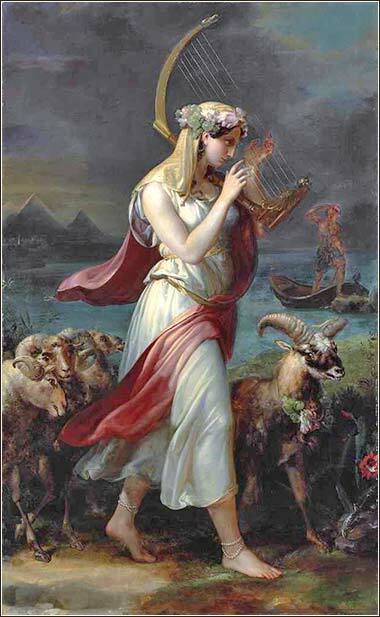 Israelite Shepherdess in the Land of Goshen, by Wilhelm Hensel, ca. 1840. Proverbs 30:5-6: Every word of God is flawless. Do not add to his words or He will rebuke you and prove you a liar.